High blood sugar levels, low blood sugar levels and high dietary salt intake might be linked to the occurrence of seizures. Blood sugar is the brain's main fuel. When blood sugar increases or decreases drastically, this result in an instability in the brain's metabolism. Salt is one of the molecules that help make brain cells work. When the brain's metabolism or response rate changes, this can lead to seizures. A low-carb diet that restricts the intake of sugar and salt can help reduce the intensity and frequency of seizures. Seizures are the result of over-excitement in a small isolated group of neurons. A seizure occurs when the over-excitement spreads to larger brain regions. In a grand-mal seizure, the excitement of one or more neurons has spread to the whole brain. When most or all of the brain is over-excited, the brain's neurons send signals to the body in an uncontrolled way. This can result in severe convulsions and a loss of consciousness. 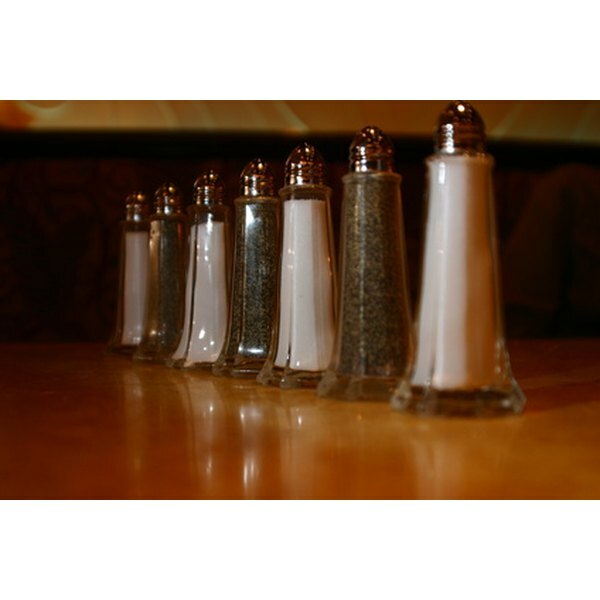 Table salt, or sodium chloride, plays a crucial role in neuron firing. For neurons to fire, the neurons' sodium channels in the cell membrane must be open. Sodium passes into the cell through open channels. After the neuron has reached its "action potential," or maximum activity level, potassium exits the neuron. This causes the neuron to decrease in activity. When sodium concentrations accumulate in the brain's tissue, neurons are more likely to get over-excited and fire uncontrollably. This can result in a seizure. Insulin is the main hormone that transports glucose, or blood sugar, to the body's cells for use as an energy source or for storage as glycogen, or fat. Severely low levels of blood sugar can occur when the blood concentrations of insulin are too high. Elevated levels of insulin can occur as a result of an insulin overdose. As individuals with type 1 diabetes do not produce enough insulin, they depend on insulin injections or sprays to stabilize their blood sugar. If these individuals do not carefully control their insulin intake, they might accidentally take too much insulin or they might take the recommended amount, but forget to eat. Too high levels of insulin in the blood can result in a drastic and dangerous lowering of glucose levels. When the drop is rapid, the brain is starving. This brain instability can lead to seizures and a loss of consciousness. Extremely high blood sugar levels can occur in cases of untreated diabetes or insulin resistance. Insulin resistance is a condition in which the pancreas produces enough insulin, but the cells remain unresponsive or less responsive to the insulin. As a result, glucose is not absorbed by the body's cells. Some of the excess blood sugar is excreted in the urine. The rest stays in the bloodstream or passes over into the brain. Low-carb diets low in salt intake can prevent seizures from occurring. The Ketogenic Diet Center at Johns Hopkins hospital, which is the leading medical center for the prevention of seizures through dietary restrictions, recommends a low-carb diet known as the "ketogenic diet" as a way to reduce the frequency and intensity of seizures. A ketogenic diet contains high amounts of fat, adequate amounts of protein and very low levels of carbohydrates. Carbohydrates are the main source of glucose, the main fuel for the body and brain. When carbohydrates are low, the muscles use fat as an energy source. The fatty acid component of fats, however, cannot enter the brain. To get enough energy, the brain switches from glucose metabolism to ketone body metabolism. Ketone bodies are a byproduct from the liver. Though no one knows exactly how, a ketone body metabolism has a stabilizing effect on the brain's neurons, which minimizes the risk of seizures. To further minimize the risk of seizures, the Ketogenic Diet Center recommends reducing your intake of salt.